Special visualization software tools enable us to locate anatomical structures typically hidden by traditional x-rays can be viewed in 3-dimensions, allowing pinpoint placement of implants. Locating nerve channels, accurately measuring bone width and 3D views of sinuses makes your surgery more precise, faster and more successful. We can also coordinate treatment with colleagues and explain conditions and treatments to you with greater clarity and accuracy than ever before. This is the same technology used by advanced medical centers. 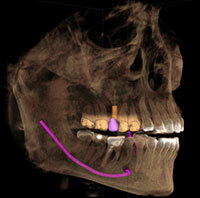 A single, low-dose, 14 second 3D scan creates a large volume of x-ray information with perfect image quality. All of this is accomplished with much less radiation exposure produced by medical CT scans, equivalent to only 4 dental bitewing films! Structure of both hard and soft tissues associated with sleep apnea, sinus and airway related issues as well as TMJ/TMD and jaw joint arthritic conditions can be more completely seen and delineated. For pin point location of impacted teeth near major nerves, visualization of oral pathology, facial trauma and understanding of developmental deformities, 3D imaging has no match in the 2D world. And most exciting, Sirona’s Galileos 3D imaging, is the Cone only Cone Beam system that seamlessly integrates with CEREC CAD/CAM technology, our other virtual treatment planning system, allowing for Guided Implant Placement which is the efficient planning, placement and restoration of dental implants. These procedures can be performed with levels of accuracy not attainable with older technologies. And viewing hidden, obscured areas allows for better all-around diagnosis and dental treatment.